The Parent Power BootCamp is designed to educate parents and caregivers on the Every Student Succeeds Act (ESSA) and the changes it requires of their children’s schools and schools districts. The Parent Power BootCamp will empower and mobilize families to use this opportunity to advocate for equitable systems that support Black children and families. 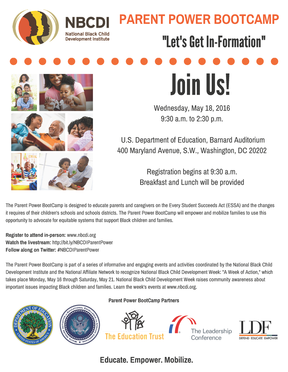 The Parent Power BootCamp is part of a series of informative and engaging events and activities coordinated by the National Black Child Development Institute and the National Affiliate Network to recognize National Black Child Development Week: “A Week of Action,” which takes place Monday, May 16 through Saturday, May 21. National Black Child Development Week raises community awareness about important issues impacting Black children and families. Learn about the week’s events at www.nbcdi.org. Next ONE CHILD AT A TIME-ONE FAMILY AT A TIME!